Wanneroo Secondary College students and principal Pauline White with East Metropolitan MLC Samantha Rowe, Education and Training Minister Sue Ellery and Wanneroo MLA Sabine Winton. PARENTS can find out more about online bullying in a guide released by the State Government and Legal Aid WA this month. R U Legal? A guide for parents in the digital world includes legal advice for parents about sexting, image-based abuse, filming young people fighting, and cyber bullying. It also includes information about the legal consequences if young people break those laws. According to statistics from Bullying No Way!, one in four Australian students in years 4 to 9 reported being bullied every few weeks or more often, and about one in five young school students reported experiencing online bullying in any one year. 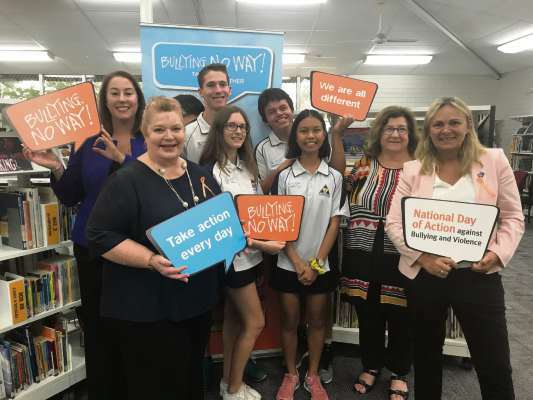 Education and Training Minister Sue Ellery visited Wanneroo Secondary College with Legal Aid WA to release the guide on the ninth National Day of Action against Bullying and Violence on March 15. “Cyber bullying has become a significant issue for young people,” Ms Ellery said. “It is estimated that throughout a 12-month period, approximately 20 per cent of young Australians aged from eight to 17 years old have been victims of cyber bullying. The minister’s Parliamentary Secretary, East Metropolitan MLC Samantha Rowe also spoke about her ‘Reducing bullying in schools’ project at the Wanneroo school. “It is important for schools, parents and the community to work together to stop bullying behaviour in schools,” she said. Attorney General John Quigley said a shared understanding of bullying and cyber bullying was essential for positive and lasting action within the whole community.